We are the only Bean Bag manufacturer in Singapore that can fully customise your beanbag to your choice of fabric(s) and colour(s). Our uniquely designed and quality Bean Bags provides the perfect combination of support, luxurious feel and comfortable New-Age interior furniture for today's modern home. Functional and stylish, our wide range of designs plus multitude of materials and colour schemes caters to your individual needs and preferences. It cultivates a soothing and relaxing environment in your home - a great way to rest and relax. Beanbagmart is proud to present you our latest service, Demo @ Home. This service has come about from numerous feedback from our treasured customers, who testify that to truly understand what beanbag you need - you really have to physically plop your rear end and sink into it! To that end, instead of you coming to us - we will go to you! So sit back, relax, and let us come to you with an array of comfy and stylish beanbags that will complement your home. 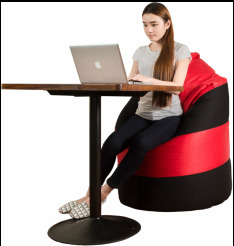 We promise you that there is absolutely no obligation on you to purchase a beanbag. Don't come to us - we will come to you! A very special promotion is on now at Beanbagmart, where we are giving you the very best value on this SOHO combination package. ​30% off on our "Double-M Rester"
4. To snuggle up in after a long day at work. The Handbag Rester, while taking its namesake from the handles that adorn the top (for easy transporting from one end of the house to another) is one of our most versatile beanbags. 2. High Computer Chair - supports your lower back fully, moulding your shape. Normal chairs make your back feel stiff, the Handbag rester provides comfortable sitting, all the time. Click on the pic to the right to see what colours are available and get yours today! Have fun in the Sun with our waterproof beanbags! 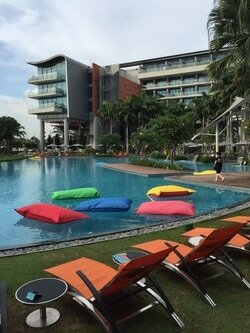 Our newest model, the Floater Beanbags are used in the W Hotel, and have proven a big hit with its guests. They come in bright, brilliant hues guaranteed to brighten up anybody's day! The Splash Rester - floating bliss! What could be better than a beanbag? ​Answer: Beanbags with beautiful models, of course! ​Beanbagmart is proud to be one of the sponsors of Asia's Next Top Model. Check out the video clip and see why even beauties need a comfy beanbag to snuggle down in.